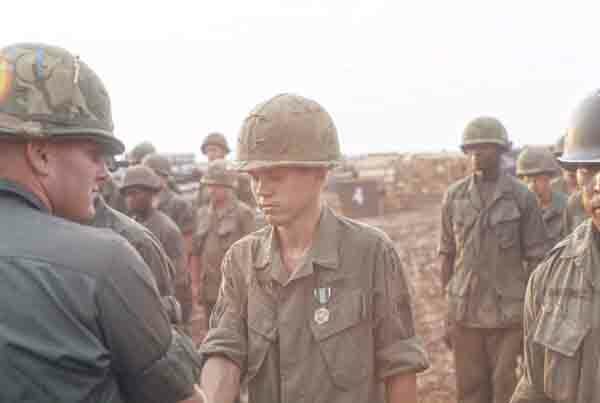 Vic Cooper, my best friend in FDC and sandbag filling partner, is getting his medal and he does not look excited. Captain Neal’s uniform is form fitting and neatly pressed while everyone else looks like they live on the ground (they do). Army Award of Medals ceremonies are formal and we are dressed in our best uniforms. The infantrymen in the firebase were much more ragged and had a good laugh, as we stood fully dressed in formation. A major rule in a combat zone is do not gather in groups, yet we are openly standing in a large one; Catch-22 is not just a book by Joseph Heller.